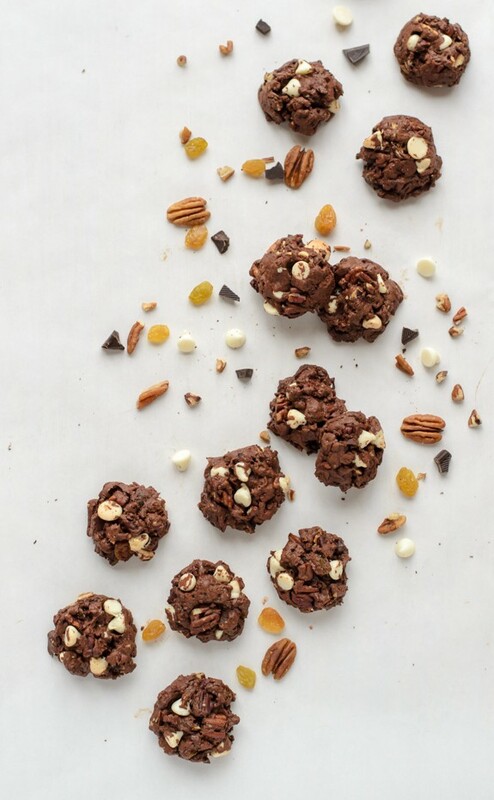 The next time you feel as if you are coming apart, reach for a Dark Chocolate Chunker Cookie. These deep, dark treats are so loaded with marvelous mix-ins, they are barely holding it together, and it is the overload that is the essence of their glory. You are in good company. By all reasonable measures, Dark Chocolate Chunker Cookies should fail. They contain a scant three tablespoons of unsalted butter and 1/3 cup of flour, yet boast a full 4 1/2 cups of mix-ins. The amount of chocolate involved is positively irresponsible, and for goodness’ sake, there are raisins. Seriously? What kind of cookie is this? It is the one of the best cookies I have even eaten, if not the best. Ben doesn’t have much of a sweet tooth, so I typically give at least half each dessert I bake away, but not these dark chocolate treasures. You’ll have to come pry what few remain away from my feisty grip, ignore my pathetic pleading, and dodge my pointy elbows. 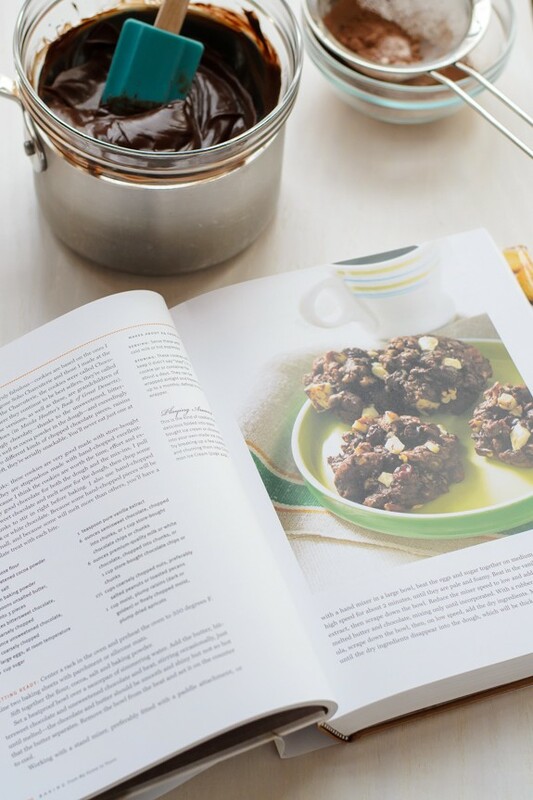 I should not have been surprised that the recipe is fantastic, considering it hails from my all-time favorite baking cookbook, Baking: From My Home to Yours by Dorie Greenspan, which is also today’s giveaway prize. Of the 12 consecutive giveaways I’m hosting this month, today’s cookbook is not the giveaway with the highest dollar value, but it is perhaps the one about which I am the most excited, because it is very personal to me. I can’t say enough positive things about Baking. The pages of my copy are splattered with butter and flour, and I aim to bake my way through it in its entirety before I hang up my apron. Dorie’s recipes are the perfect balance of classic and creative, and her warm stories make me feel as if she were in the kitchen cooking beside me. Honestly, I wish I could send every single one of you a copy, but if you don’t win the giveaway (and even if you do), definitely buy two: one for yourself, and one for a baker in your life whom you love. I recommend a baker who likes to share and lives in close proximity. Today’s Dark Chocolate Chunker Cookies are my take on Dorie’s “Chocolate Chunkers” from the oh-so-enticing cookie chapter of Baking. According to Dorie, they are based on a recipe for “Chocolate Chubs” (previously called “Chocolate Gobs”) from the well-known Soho bakery Sarabeth. All I know is that they are simultaneously excessively chocolaty and dangerously snackable. The chocolate cookie batter reminds me of a decadent brownie. It’s smooth, glossy, and a trifecta of cocoa powder, bittersweet, and semi-sweet chocolate. Use the best chocolate you can for these dark chocolate cookies, and if possible chop your own instead of buying chocolate chips. The flavor truly shines, and it’s worth busting out the good stuff. Now, we enter the wild. An overload of toasted pecans, plump golden raisins, and even more chocolate—both white and semi sweet—arrive on the scene and stretch the batter until it threatens to falls apart. The batter will extend just enough to hold the mix-ins together, and you are going to want every precious piece. 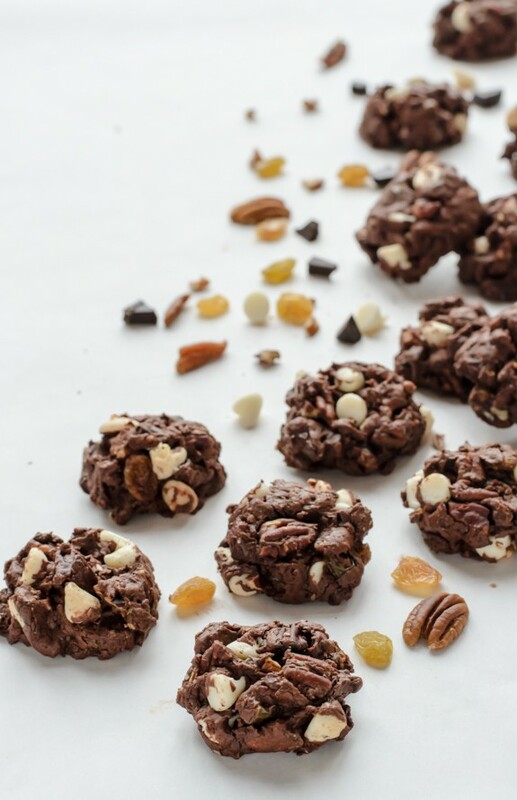 Dark Chocolate Chunker Cookies manage to be gooey and craggy, homey and luxurious all at the same time. I’m still not quite sure how they hold it all together, only that the results are so wonderful, I should probably stop asking so many questions, and stuff another cookie in my mouth instead. Now the giveaway! To enter to win a copy of Dorie Greenspan’s Baking: From My Home to Yours, use the widget below. Please be patient, as it may take a few moments to load. 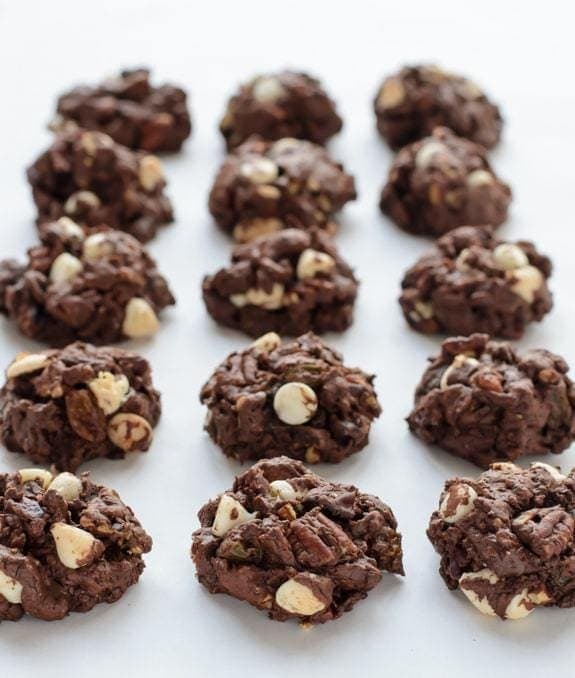 Gooey dark chocolate cookies loaded to the max with three kinds of chocolate, pecans, and golden raisins. Every bite packs a chocolate surprise! Both ultra decadent and dangerously addictive, these cookies will become a fast favorite. Place a rack in the center of your own, and preheat the oven to 350 degrees F. Line two baking sheets with parchment paper or silicone mats. In a small bowl, sift together the flour, cocoa, salt and baking powder. Set aside. Set a heatproof bowl over a saucepan of simmering water, ensuring that the bottom of the bowl does not touch the water's surface. Add the butter pieces, bittersweet and unsweetened chocolate. Heat, stirring occasionally, just the chocolate is almost melted, then remove from heat and stir until it melts completely. Remove the bowl from the heat, and set it on the counter to cool to room temperature. In the bowl of a standing mixer fitted with the paddle attachment or a large bowl, beat the eggs and sugar together on medium-high speed for 2 minutes, until they are pale and foamy. Beat in the vanilla extract. Scrape down the bowl, the reduce the speed to low and add the cooled chocolate mixture, mixing just until incorporated. Scrape down the bowl, turn the speed to low, then add the dry ingredients, mixing just until the dry ingredients disappear into the batter. The batter will be thick and shiny. 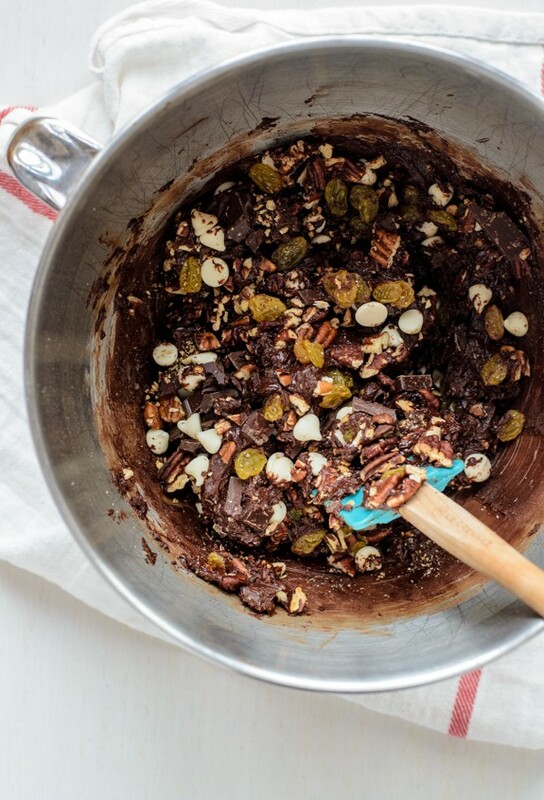 By hand with a rubber spatula, gently stir in the chopped semisweet chocolate and white chocolate chips, pecans, and raisins. The dough will seem very overloaded and will be mostly mix-ins. This is just as things should be. For small cookies drop the dough by tablespoonfuls onto the baking sheets, leaving about an inch of space between the mounds of dough. (For larger cookies, drop by rounded tablespoons and increase the baking time by 1 to 2 minutes. Bake the cookies one sheet at a time for 9 minutes (1 to 3 minutes longer if cookies are larger) minutes, rotating the pan 180 degrees half way through. The tops of the cookies will appear slightly dry and the inside will be soft. Gently transfer the cookies to a cooling rack to cool to room temperature (or not). Repeat with the remaining dough, baking only one sheet of cookies at a time in the center of the oven, and cooling the sheet completely between batches. If, when the cookies are cooled, the chocolate is still gooier than you'd like, simply refrigerate the cookies for about 10 minutes. Actual cookie yield may vary depending upon the size of the dough scooped. I am delighted to be personally providing this wonderful cookbook to the giveaway winner. I like baking cut out cookies mostly because my kids really enjoy it. I make and roll the dough and they get to cut out whatever shapes they want. Sometimes we get Halloween designs at Christmas! A few years ago I discovered a (slightly) boozy pecan bar recipe from ATK that is now a must have for holiday potlucks and parties. These cookies look luscious! Thank you! I love baking sugar cookie cut outs during the holidays. Adding quirky decorations with the family with Christmas music blaring is one of my favorite holiday traditions. It’s not really baking, but I’m known for the caramel and chocolate covered pretzel sticks I make every year. My favorite thing to bake is an old recipe from my grandmother. I don’t know that they have a translated name, but essentially they are hazelnut meringue cookies. My grandma’s sour cream sugar cookies are absolutely mandatory for Christmas with my family. Sour cream sugar cookies sound like heaven! Will you share the recipe or is it a family secret?? I love baking cookies, but my favorites during the holidays are cinnamon-sugar pecans and homemade marshmallows. So much better from scratch. I can’t say what flavor, but my favorite thing to bake during the holidays are cupcakes and/or cakes. My family expects and eagerly awaits them! I vary the flavors. Last Christmas I baked a 16th Birthday Cake for my niece whose birthday is December 30th. Her cake of choice is chocolate. Along with that, I baked gingerbread cupcakes with cinnamon frosting. I really like making toffee or gingerbread cookies for the holidays! Last year I made a Swedish Tea Ring for my Swedish grandmother and it was beautiful and delicious! Like cinnamon rolls, but even more special since it was in a beautiful wreath. I plan on making this a tradition! My favorite cookie to bake is ginger snaps. My daughters and I found the recipe in the Three Rivers Cookbook (Pittsburgh, PA) and haven’t found any other recipe that comes close. It’s our go-to recipe that we make every Christmas. Cookies are by far my favorite thing to bake, but I love making peppermint bark too! These look wonderful, Erin! Cookies are my favorite thing to bake during the Holidays and my favorite cookie of all time are the chocolate-covered cherry cookies! i’m boring because my favorite is just a classic chocolate chip cookie recipe :p but if i had to pick a second, it would be pecan pie! Also, these are beautiful blog photographs! I love baking ginger cookies during the Holidays. I discovered them last year together with my son and we made a whole bunch of them. I love love love chocolate!!! I like to do something different every year for Christmas. Truffles,Chocolate bark. I love to bake. Always have. I get that from my Mom. She taught me how in the kitchen years ago!! I love to bake cookies, cakes you name it!! I love making spritz cookies with tree shapes and tinting the dough green. My other favorite is special k marshmallow wreaths. Sometimes the easiest recipes are peoples’ favorites–I love making turtle bars for the holidays. An all time favorite with family and friends! I love to make a special fruitcake for Christmas, but the recipe takes at least 8 weeks! I didn’t start soon enough this year, but I have next year’s start date already added to my calendar! Thanks for the chance to win! I love to make biscotti! It is the perfect morning pairing with coffee around the tree. I love to bake cookies listening to Christmas music. Erin, I have a couple of go-to items that I bake every year: a ginger-pear bread that is amazing and ginger snap cookies. Can you tell I like ginger and molasses? Holidays mean Kringles and cookies to me. Thanks for the chance to win this awesome book. I enjoy making buckeye bars. Must make cut out sugar cookies too. I don’t have a holiday specialty; I prefer to try new recipes. Last year it was cookie dough truffles. This year it might be some kind of fruit cake. Every year I mean to make my family’s Swedish cardamom bread recipe – but this year I am really going to do it, I swear. However, I do manage to make at least a few batches of cookies, and this year I’ve thrown in a few truffles for balance as well. Thanks! It just wouldn’t be Christmas without making my Nonna’s Date Bars. One bite takes me back to when I first tasted them as a little girl in her kitchen. best if refridgerated in container. Saltine toffee is IMPOSSIBLE to resist Cheryl. Thanks for the recipe!! I love to bake all things chocolate for Christmas. Dark Chocolate Fudge is my favorite, though! These cookies look divine! I can’t wait to try them. Great Grandma’s Cookies are the favorite cookie in our family. A rolled out (very thin) oatmeal sandwich cookie with date filling between the two oatmeal cookies. What yummy looking cookies! And that cookbook looks awesome, should check it out soon! Sugar cookies that my niece and I decorate for our family’s Christmas dinner. This is sort of a strange question but.. that photo of the chocolate all chopped up? 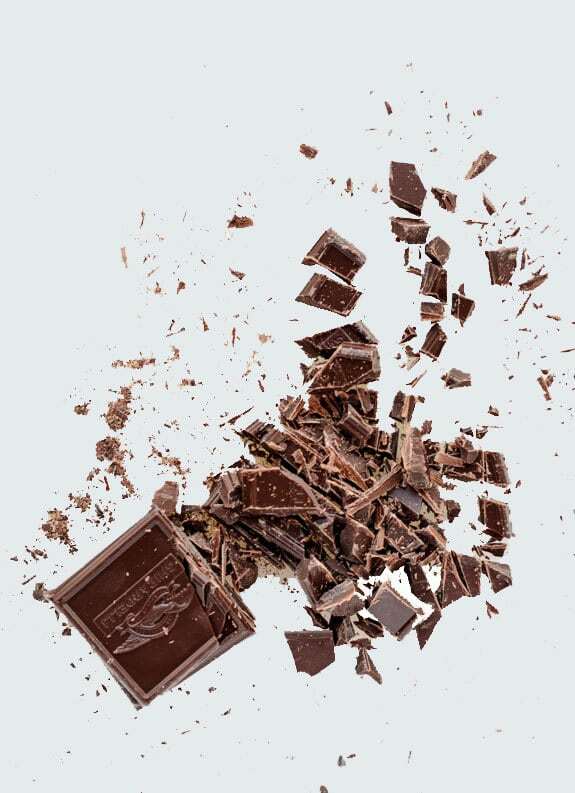 Is the chocolate actually *in the air* or is it lying on a surface?! Because it sort of looks like it’s in the air, and if that’s the case, I am just quitting now and packing up my camera and computer and starting a slow clap for you because *da-yum*. Also, how are you so incredibly on top of things?! I post like once a week now, and you’re like, oh hey, 12 in a row, BOOM. On a more relevant note, these look perfect for people like me who prefer the fillings and toppings of things to the actual base of the thing.. I’m that girl who asks for 13 cherries at Jeni’s and who starts with MAYBE 1/4 cup of yogurt at the fro-yo places and still ends up spending $8. I love your question, and I WISH I could catch chocolate jumping in the air. It’s just sitting flat on my cutting board. Much less exciting ;-) Also, HIGH FIVE for mix-ins! I love your photos for these cookies! The cookies look pretty damn good too! Thank you so much Jessica! I had trouble not eating them all before I finished the shoot, hehe. I love to make all things pumpkin! I still have a reindeer cookie cutter from my childhood, which imprints a ‘harness’ across the waist as you cut. If you roll the dough out too thin, or press too hard, the cookies are very fragile there. (Broken ones were a perk for the decorators!) But they’re really cute with a stripe of red frosting and some silver balls for harness bells, and maybe a cinnamon red-hot stuck on the nose. LOVE the photo of the chocolate being chopped. Gorgeous! At first glance it looked vertical rather than horizontal, and the chocolate chunks are leaping for joy. Pure Christmas cookie joy! Yippee! I have favorite recipes that I make at Christmas to share with friends: chocolate snowballs, lemon squares, apricot squares, raspberry squares, chocolate cookies frosted and with crushed candy canes on top. That is my project for tomorrow to deliver to friends on Thursday. I wouldn’t share these either – lucky for you Ben doesn’t have a sweet tooth – my taste tester (daughter) will fight me for these! Thanks for sharing your version of Dorie’s “Chocolate Chunkers”! Although it’s extremely rich, I love making trifle for the sweet to follow Christmas dinner with family. The custard is time consuming but totally worth it. The trifle can be customized with what’s in season for fruits or what I like currently. Otherwise, it’ll be Sticky Toffee Pudding, baked not steamed, with fabulous toffee sauce using Golden Syrup. And cookies: World Peace Cookies from a recipe by Dorie Greenspan. They can be stored in the refrigerator for a few days and baked last minute. Incredibly rich, deeply tasting of chocolate and satisfying, alone or with sorbet or vanilla ice cream and a cup of something hot. I too have pointy elbows in my weapon aresenal. Cookie theives beware! My favorite thing to bake for the holidays are mint chocolate brownies. Ah those cookies!!! 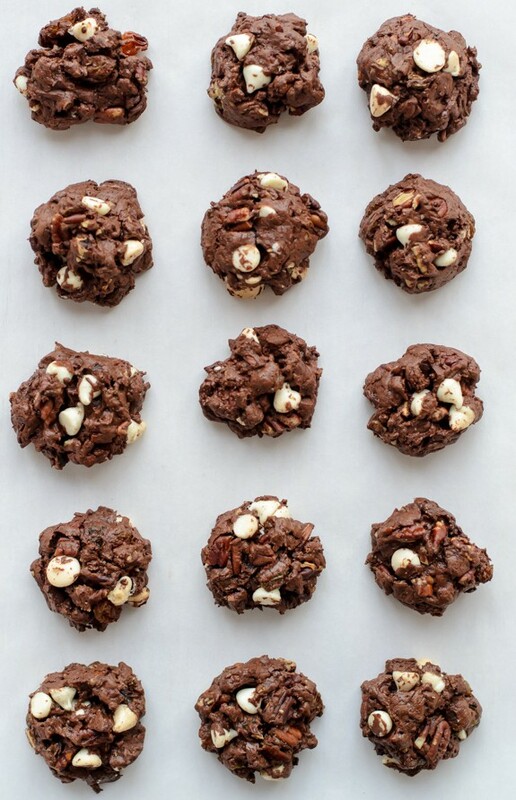 Love dark chocolate… My must-bake cookie list is growing! My favorite thing to bake around this time of year is pumpkin chocolate chip bread (because it’s so simple to make), but I’ll never say no if someone else wants to share some of their snickerdoodles or sugar cookies with me… :) Your dark chocolate cookies look delicious, too! I love making English trifle at this time of year. My husband and I both love it. I cook a massive, fancy brunch on Christmas morning and anyone of our friends in town that would like to join our family is invited. I always make chorizo breakfast strata, individual servings of coconut rum bread pudding and grand marnier bread pudding, and a rotating third and forth item depending on the number of guests. It’s my favorite! I like to bake sweet potato and also bake pecan pies! I always look forward to good ole frosted sugar cookies! I love to make tons of different flavors of biscotti. I love making gingerbread men! I have a tradition where I hand them out to all of my friends around the holidays and they’re always a big hit! I like making coconut macaroons! They are so easy! Sugar cookies for all the memories. Plus I love them. My favorite thing to bake for the holidays are peanut butter thumbprint cookies. I Absolutely love bake chocolate chip pecan cookies and mocha snow ball cookies on Christmas Eve, the are Santa’s Favorite. i love baking a new christmas cookie every year that becomes a family favorite. last year it was rosemary shortbread cookies. the year before was peppermint sugar cookies. this year, who knows? I love baking oatmeal chocolate chip cookies during the holidays! I like making biscotti for the holidays. It’s a fun and different treat to give out. Molasses buns are a tradition in our house! I enjoy baking a lot of different items around Christmas. My daughter and I give out gifts to friends and family members for Christmas from our family. We decide what items we are going to make then go with that. Like last year we made pies. I think that this year we are going to go with cookies. I love baking gingerbread men and shortbread cookies at Christmas. I love to bake! It can be cookies, cakes, breads, pies…..you name it. Baking makes me happy! Fave thing to bake over the holidays .. cookies!!! and I don’t have this amazing cookbook!!! I am so in love with the name of this recipe! I can’t wait to taste that dough…like brownie batter? Yes please! My beloved mother-in-law’s recipe for Mandle Bread. Cookies are my favorite holiday treat to bake – although last weekend I made some dark chocolate banana bread. My beloved mother-in-law’s mandle bread is a favorite here. I love baking rum cakes. This time of the year, I love to bake Pumpkin Cranberry Pecan muffins. Although Thanksgiving has passed, pumpkin and cranberries are great throughout the colder months! Me too, me too! Dorie Greenspan is an angel on earth. That cookbook has never let me down! My favorite is cookies, I have ten grandkids and they love any and all cookies. The little ones want the ones they say are the yummiest but the older ones want ones with candy it them. As far as I am concerned cookies are everything as long as they are happy. Snickerdoodle cookies are my favorite! I love to bake Peanut Butter Cookies with Chocolate Kisses. Cookies – especially the ones my mother used to make every year – spritz, pecan crescents, molasses. During the holidays I love to bake thumbprint cookies rolled in walnuts with grape jelly centers. Gingerbread anything! Scones, cake, cookies….love. Chocolate chip biscotti — my fave all year round! My kids beg for Danish Puff for Christmas morning. It’s a basic almond butter danish with a butter cream icing and walnuts. Or if it’s Christmas, fun sprinkles. From the old school Betty Crocker book. When I think of Christmas dessert, the first thing I think of is COOKIES!! They are my favorite dessert and I love that I can make a nice variety of different kinds. I am the main baker in the family so I make tons of cookies to take for the family! I love these cookies so much. In particular because they are called chunker cookies, how apt is that?! Gorgeous! I love to bake Red Velvet Cheesecake for the holidays. I’m exactly like that when it comes to chocolate cookies too. ANY kind of chocolate cookie. My guy avoids baked goods like the plague (which makes my baking obsession kind of difficult at times), so I give away 90% of what I bake. But when it comes to chocolate cookies? I hoard every single crumb. I’d definitely do the same with these! :) Pinned! It is tradition for my family to bake date nut filled cookies during the Christmas season. The recipe was shared with my mother by my paternal grandmother who I hear was a perfectionist with each step. I remember helping with the assembly line even when I was very young. The process took a full day and the entire kitchen (like ravioli day pictures from your family!) Mom would cook the filling and mix the dough in the morning. After she rolled and cutout circles, Dad would add a spoonful of filling to each one. The remaining steps were folding the cookie over into a crescent shape, crimping the edges with a floured fork, wetting the top with one hand, and adding sprinkles with the other. Yes, my water hand would occasionally end up in the sprinkle bowl if I lost rhythm! Countless cookie sheets and cooking racks later, Dad would pack the cookies for mailing to family and friends who expected the box each year. Enjoying a date nut filled cookie with breakfast was entirely acceptable! I make a ton of different cookies and few other treats like fudge and bark and the list goes on. I love baking venetian cookies (Italian rainbow cookies.) They are a bit labor intensive but look beautiful and my kids waited for these to appear each year. Now that they are grown it’s so much fun to see their faces when they come home and race to see who gets to them first! I make my Grandma’s shortbread recipe from Scotland and the Rice Krispy peanut butter balls rolled in chocolate that I got from Danielle. My granny always made us Snickerdoodles around Christmas. So now, I continue the tradition and always make them. I love baking an assortment of cookies every Christmas! It’s also become a tradition for me to make a big batch of spiced nuts to divide up and give as gifts. If I have to make only one it will be chocolate shortbread; so easy, and so delicious! I have business associates that I thank each Christmas with home-made baked goods. I like to try new recipes all the time; some recipes have been successes, some not so much and don’t come back for an encore. One that is so good it is requested: my Sauvignon Blanc bundt cake with pineapple glaze. So many cookies, so little time! My go to is the cranberry white chocolate oatmeal cookies recipe on the Craisins package. That’s the one that people ask for! I love to make a Mexican hot chocolate cream pie! It’s simple, decadent, and has a holiday kick with the cinnamon and cayenne! Bread pudding with brandy sauce. My favorite thing to bake around the holidays is cinnamon rolls to share with family and friends! I’m always amazed at how dough can become a cookie when so little flour is used. These look so delicious! My husband doesn’t like cookies that are too sweet, so these would be perfect! My favorite thing to bake are quick bread, like pumpkin and banana, to give as gifts. Eggnog Cheesecake and thumbprint cookies are some of my favorite things to bake for the holiday season. Love to make sugar cookies with my mom and sister! My favorite thing to bake is Christmas cut-out cookies! Ahhh raisins…in cookies?! Noooooo. But your photos are making me wanna try them! I like baking my grandmother’s sugar cookies. I don’t get it quite right – yet – but I will! My favorite thing to bake for the holidays is granola, as I can make something relatively un-bad for you that still tastes good, in large enough quantities quickly that I can give away to friends and co-workers. But recently I’ve gotten into making baked donuts. Help! I love baking apple pie with the family! I have to give you two: I love baking gingerbread houses so we can decorate them, and my new favorite to eat – your Andes mint cookies! I love to bake cut out sugar cookies for the holidays! My favorite thing to bake during the holidays is Snickerdoodles. I love baking pies when it’s cold outside. I love baking the recipes my mom used to make at Christmas. Whenever I’m making her nutbread or anise cookies I feel she’s there with me in my kitchen. I love your recipes – and your enthusiasm! I love making red velvet cinnamon rolls. I only make them for Christmas morning so they are a real treat every year! I have to bake chocolate peppermint powder cookies this time of year!